We are fortunate this Summer to have a 2nd harvest from the 8 tomato plants we have in our backyard garden. As I was washing the produce I'd just pulled off the plants, I was struck by all the colors in our tomatoes. I saw lipstick reds, scarlet oranges, yellow oranges, magenta and purple violet. 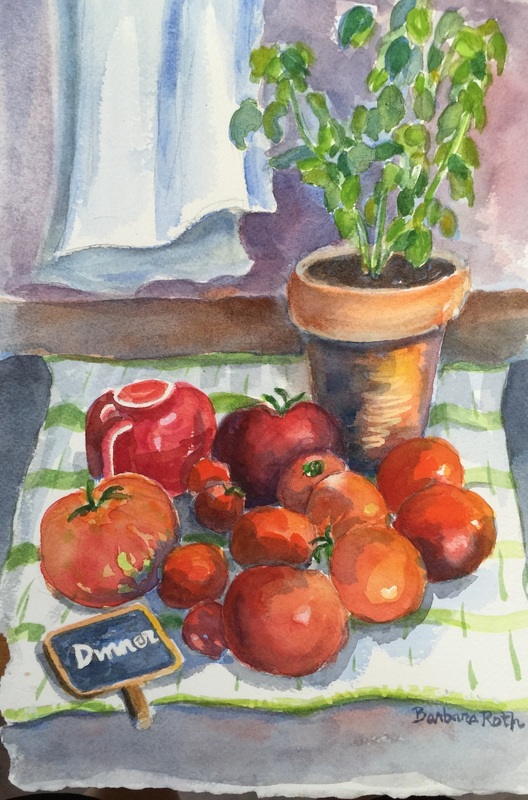 The scene got even more colorful when I put the tomatoes on our red and white dish towel that was serendipitously on our counter already drying a red mug. In a flash of something I knew I needed to create a "dinner" still life so I added the basil plant to the scene and wrote dinner on a chalkboard clip. A chorus sounded in my head and I knew I had a painting ready to be painted and titled "Bruschetta".